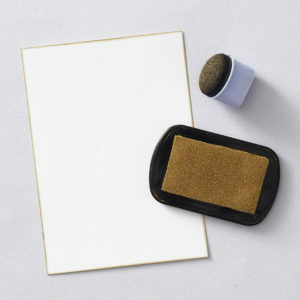 After selecting the note card size of choice, use a dauber or colored stamp pad to lightly dab the edge of your card to create a boarder. Adding a painted edge is a unique detail that really elevates the look of your card. Next, select stickers or other embellishments to adorn the card. 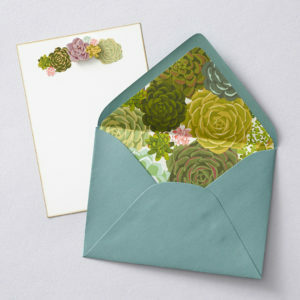 We used gold foil succulent stickers that match the color of the envelope and overall theme of our card. Place your stickers at the top or bottom of the notecard ensuring that there is enough space to write. You can add extra dimension to your card by layering your adornments with foam squares. 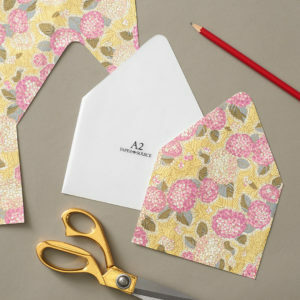 Finally, using our envelope liner template, trace and cut out an envelope liner from your favorite fine paper. 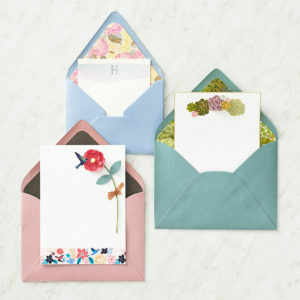 Be sure to choose the correct envelope liner template that corresponds to your envelope and note card size. 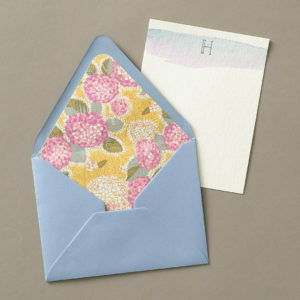 Watch “How to Make an Envelope Liner” for step by step instructions. To start, select a card size of choice from our luxe paper collection. We used luxe white. Our luxe papers have just the right amount of texture to highlight the watercolor technique but any paper will work. Next, use the aqua brush pen and watercolor set to create a band of color at the top of your card. The aqua brush allows you to control how much water and color saturation you want. Try blending two paint colors for a painterly and unique look! Allow watercolor to dry. 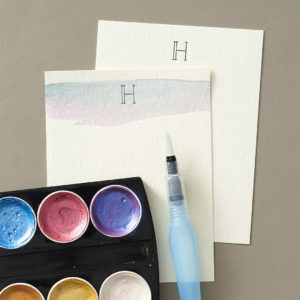 After the watercolor dries, stamp a monogram letter or unique motif over the band of paint. Choosing a monogram is a great way to personalize your stationery set for you or to give as a thoughtful gift. We used a black ink but play around with color to match the theme of your card. If you want to take your card to the next level, try heat embossing or using quickie glue for adding gold foil details that sparkle. 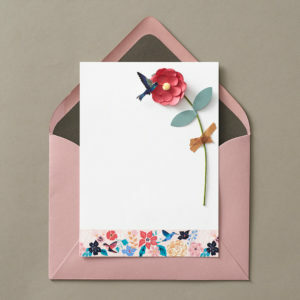 To finish, use our envelope liner template, trace and cut out an envelope liner from your favorite fine paper. This card may look overwhelming, but any level crafter can create this artisan, one-of-a-kind look with just the right stickers! Start by choosing some of your favorite new stickers and washi tape. Mix and match your selection until you find a cohesive theme. We were inspired by our exclusive secret garden washi tape set. 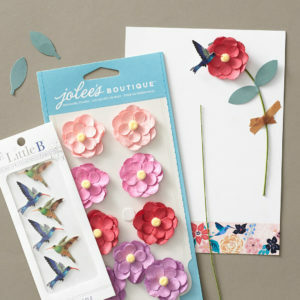 From there, we selected other embellishments that complimented this design including dimensional flower stickers and hummingbirds. Layer your washi tape and other embellishments in a design that makes sense for your theme. 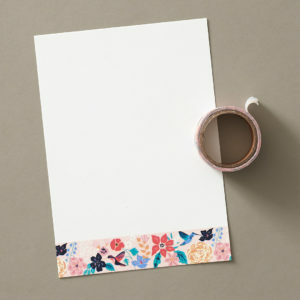 Washi tape is so easy to use, simply tear a strip off the size of your paper, lay down and trim the edges for a clean look. 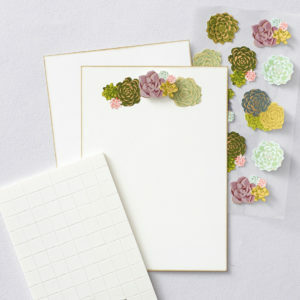 After placing washi tape down as our foundation element add your stickers at the top of your stationery. To create this flower look, we added a floral wire cut to our desired length and adhered using washi tape. 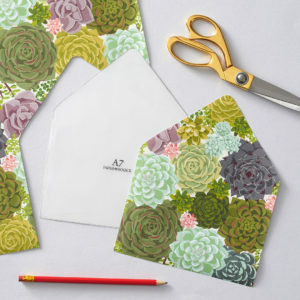 You can add paper leaves for extra dimension by cutting shapes out by hand or using a leaf paper punch. If you are feeling inspired by any of these looks, you will like our Paper Garden Creativity Box! This limited edition box is curated and inspired by our new Vintage Flora collection and filled with our favorite crafting goodies.